Time is running out, and you have to escape with the cash. Click here to play! What will you do? There is plenty at stake at this exciting slot, so get your tools ready and start cracking today! 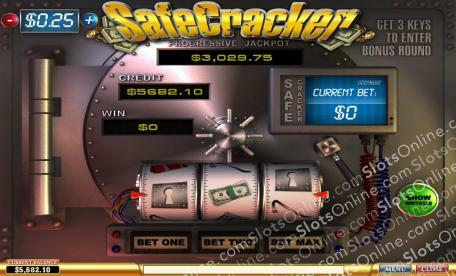 Safe Cracker is a fast-paced progressive slot played across three reels and a single pay line. There is no fun money at this slot, just pure jackpot madness. There are no Wilds or Scatters in Safe Cracker, but there is a Bonus Feature that will be triggered when three Keys appear on the reels and three coins have been wagered. The Progressive Jackpot will fluctuate throughout the day, and you can win the entire pot by landing three Dollar Bills on the pay line with a maximum bet. Take the plunge and become the greatest Safe Cracker in the world at this amazingly lucrative slot today! The Key symbol appearing on all three reels on a maximum bet will activate the exciting Safe Crack bonus round.